Our Moorooka catchment includes Tarragindi, Annerley, and Salisbury as they share many of the same soil profiles and traits, though we will also discuss the differences relevant to trees and gardening. As Moorooka is an older, developed area, its soils have been subject to the typical treatment of developers and builders. This has led to inverse soil profiles (lower layers dumped on top) on many blocks. Still, most of the same soil properties exist through the profile. Figure 1. 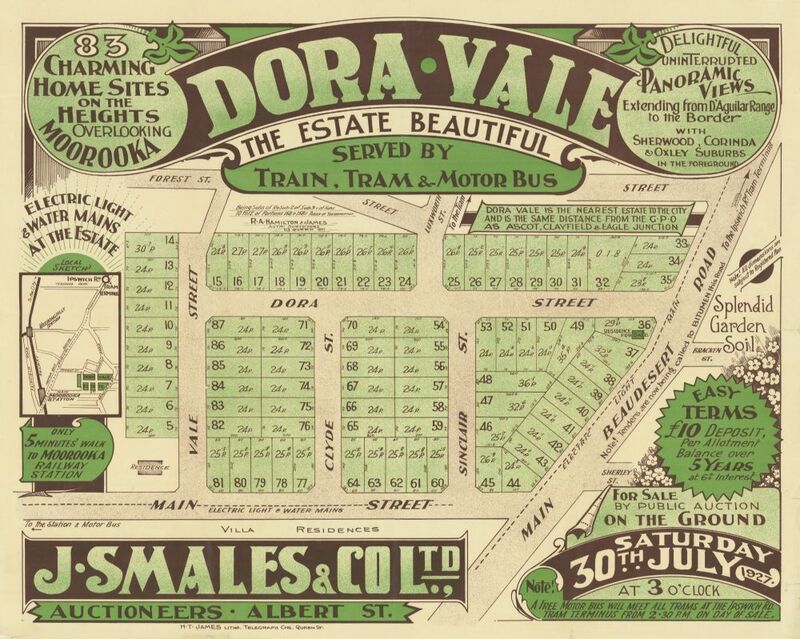 Historic Real Estate map (SLQ, 2019). Local trees of significance include the heritage-value fig tree at Annerley junction, the undeveloped Toohey Forest Park, and the sausage trees at Ekibin. Moorooka is blessed with some beautiful gardens cultivated by residents and local gardeners that include beautiful ornamentals including numerous fine poincianas. There are significant landscape trees in Moorooka and Tarragindi with vegetation protection orders: please contact us to check if your property is affected or for an arborist report. Table 1. Common trees native to Moorooka and Tarragindi (Adapted from Paten Park Native Nursery, 2019). small trees. Banksia spinulosa golden candlesticks Our classic local banksia with large bottlebrushes. Backhousia myrtifolia grey myrtle Closely related to lemon myrtle with similar looking leaves. Leptospermum whitei White’s tea tree Tea tree with small bunches of silky white flowers. trees Eleocarpus reticulatus blueberry ash Attractive pink flowers followed by purple fruit. Mallotus philippensis red kamala Used for medical purposes by local aboriginals. Melaleuca linariifolia snow in summer A fine-leaved paperbark with small, white flowers. trees Eucalyptus microcorys tallowwood Large koala tree, protected by BCC when dbh>400mm. Eucalyptus tereticornis forest red gum Named for its bright-red timber, local gum with spreading habit. The soil is quite acidic with a soil solution pH of 4.9-5.5 in most developed areas, down to 3-4.8 in patches close to bushland. This soil is acceptable for the locally-native trees but the addition of chicken manure or agricultural lime will assist in exotic ornamentals being able to access nutrients. The soil is composed of only 10-20% clay in the older developed areas of Moorooka, 10-20% silt, and a majority of sand. This provides good drainage but poor water retention and a low level of nutrients. We recommend adding fertiliser and mulch to the soil to improve soil nutrients water retention and to reduce evaporation. The soil contains only 0.1-0.2% total Nitrogen and 0.02%-0.05% total Phosphorus. That’s fine for natives with the addition of mulch, but exotic trees and plants will benefit from fertilising. A thick layer of mulch and an exclusion zone from lawn should be an adequate amendment for native trees. The ‘bushier’ areas around Salisbury have soil composed of 20-30% clay, 20% silt, and the rest sand. While it’s a nice loam mix, many of the soils are shallow (down to 75-100cm of soil) as evidenced on the rocky outcrops of Toohey Forest Park. Adding topsoil and mulch will assist in the cultivation of trees and gardens. The soil contains 2-3% organic Carbon in older developed areas of Moorooka, and 3-5% organic carbon in areas around bushland in Tarragindi. Organic soils contain over 12% organic carbon, so again the addition of mulch to soils will be beneficial. There are potential acid-sulphate soils on the western edge of Moorooka and on the border of Tarragindi near Greenslopes. Acid sulphate soils should be treated with agricultural lime. Toohey Forest is designated a koala habitat and koalas may be viewed on the walk from Toohey Forest Park to Griffith University. Most of the riparian zones (areas near streams and creeks) are declared buffer streams with conservation significance. Property owners in such environmentally-sensitive locations can help preserve these important reserves by planting locally-native trees and keeping any ornamental plants with weedy-characteristics in pots and having environmental weed trees removed. Unfortunately, there are still chinese elms and cocos palms in properties near the forests. Hornet Horticulture and Landscaping. Pat Horne is a well-equipped local landscaper who grew up in the area. He is into permaculture (which he recently studied in Jordan where he gave the desert a make-over for the locals) and property maintenance. Give him a call on 0432 132 211. We also recommend Wellers Hill Hardware and Landscape Supplies for plants and soil– Paul is himself a licenced structural landscaper so he can offer plenty of advice with your purchases. There are few properties in the area that wouldn’t be helped by a delivery of his garden soil.